This was quite possibly the first time I actually felt guilty cooking dinner just for myself and then sitting down solo at my dining room table. Not because it was so incredibly decadent that I shouldn’t be eating it. Not because it was one of my husband’s favorite dishes and he wasn’t here to enjoy it. No, the reason I felt guilty (just a little) was because it was so amazingly good and elegant. What business did I have serving myself this fancy schmancy dish?? This was truly a company-worthy dinner. I should be showing this off to friends and family! Instead, I sat down by myself and marveled at the combination of tastes, flavors and textures in this incredibly simple dish. Seriously, I was not expecting this dish to be so good. It was just something different — a new recipe I found that looked interesting and forced me to try yet another fruit that I don’t use much (mango). But this was definitely one of those “symphony” dishes — where everything works together in harmony to make each simple component more amazing than it has any right being. 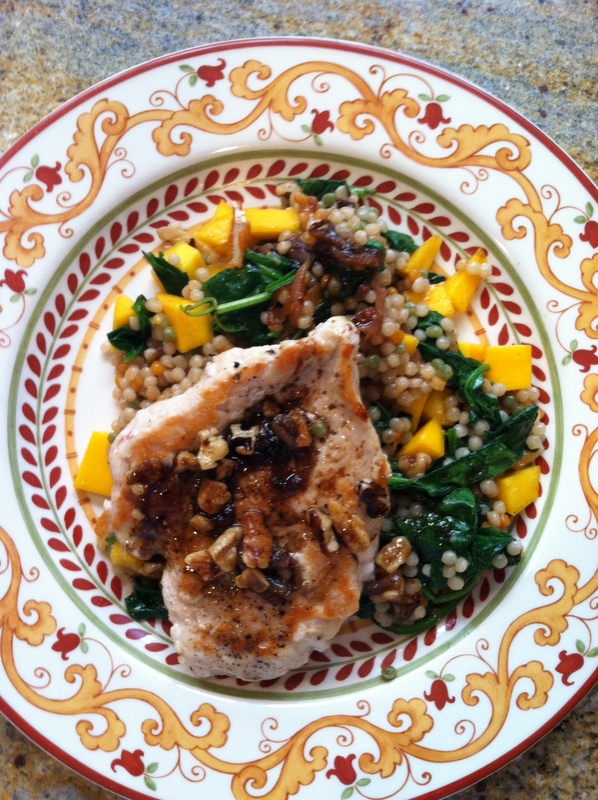 The dish is Grilled Chicken with Curried Couscous, Spinach, and Mango and it comes from Fine Cooking Magazine. Fine cooking it was indeed. The only change to the recipe was that I switched out the almonds in favor of walnuts and I had regular, pearl couscous, not whole wheat. Finally, since it was just me, I did not grill the chicken but simply sautéed the lone chicken breast. Actually, truth be told it was not the chicken that was geographically impaired … it was the cook. I had been going around thinking that on Saturday I was going to make Peruvian Garlic Chicken. I told my husband that he was grilling Peruvian Garlic Chicken. I wondered “what should I serve with the Peruvian Garlic Chicken?” I considered what wine would be best with Peruvian Garlic Chicken. It wasn’t until said chicken had been quartered, marinated for half a day, and was being taken out to the grill that I actually re-read the recipe. Apparently we weren’t traveling to Peru at all for dinner…. it was Panama!! Panamanian Garlic Chicken or Pollo Al Ajillo to be exact. Oh well, no worries. It was garlicky. It was citrusy. It was luscious. Panama….. Peru….. wherever. It’s dang good chicken. The recipe comes from Saveur Magazine and the grilled corn on the cob I decided to have with it went perfectly — regardless of country of origin. 1. Place chicken and bay leaves in a bowl. Purée garlic, salt, and 2 tbsp. water in a food processor to a smooth paste. Add juice, vinegar, black pepper, Worcestershire, and allspice; purée until smooth. Rub mixture over chicken. Cover with plastic wrap and refrigerate at least 4 hours or up to overnight. 2. Heat a charcoal grill or set a gas grill to high; bank coals or turn burner off on one side. 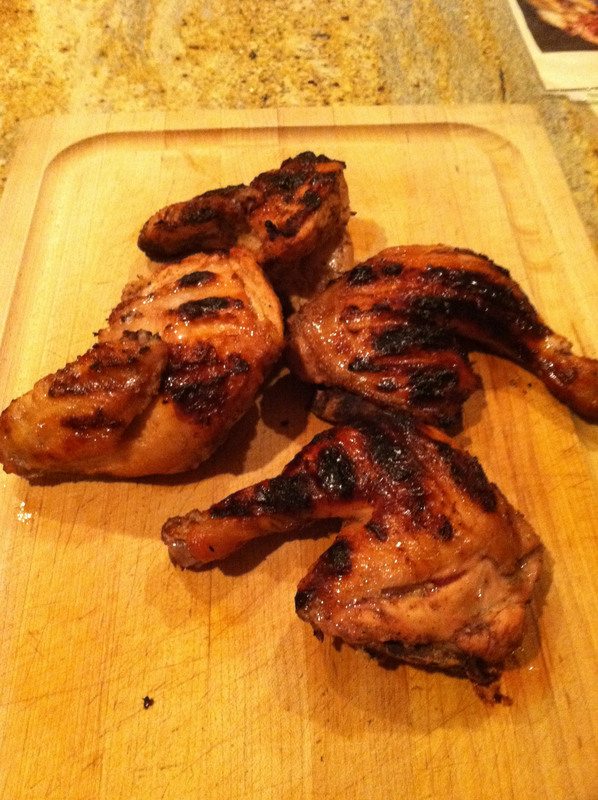 Remove chicken from marinade; grill on hottest part of grill, flipping once, until slightly charred and cooked through, 25-30 minutes, or until an instant-read thermometer inserted into thickest part of thigh reads 165°. If the outside starts to burn before the chicken is fully cooked, move to the cooler side of the grill until done. It’s a fact that things you grow up eating become comfort food as an adult. But as we age, we find that sometimes our taste buds crave a more sophisticated, “adult” version of comfort food. Take, for example mac and cheese. No longer does the boxed stuff that I loved as a kid satisfy. I need real cheese, “adult” cheese …. cheese with substance. Cheese made out of, well ….. cheese! But I digress. Mac and cheese has nothing to do with this week’s winner. This Sunday evening I found myself in the house by myself. Dinner was going to be all mine. The world was my oyster! What did I want? The possibilities were endless!! Suddenly my thoughts turned to one of my favorite childhood dinners. Garbage Meal. Now I realize my mother is not going to be happy with this. My mother is a fine cook. While we were growing up she made lovely, well-thought-out dinners. Meat, vegetable, some sort of starch. All balanced and well-conceived. However, when occasionally she was at a loss as to what to make, or schedules got crazy and nothing was put out to thaw she turned to “Garbage Meal”, and I was always very happy. 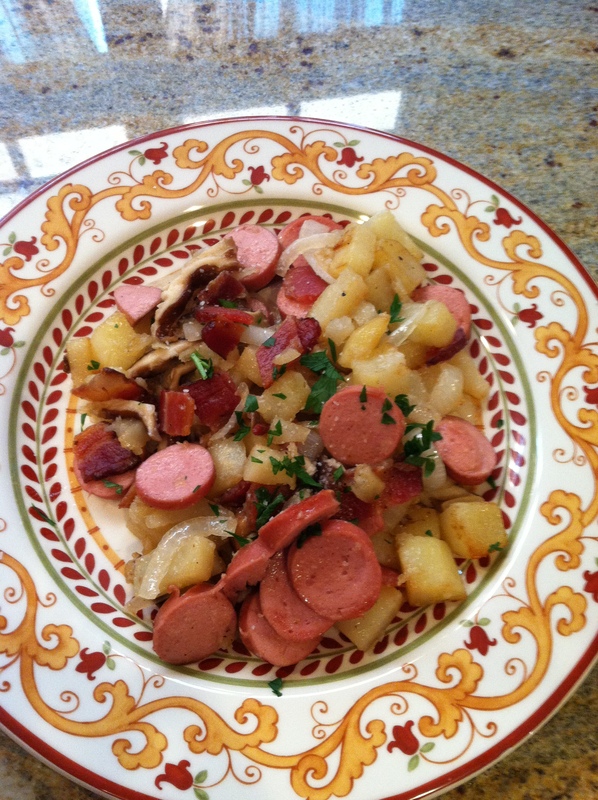 The original Garbage Meal consisted of: hot dogs, bacon, onions, mushrooms and potatoes. So does my version. The difference lies solely with the time expended to make it and the ingredients found on hand. Growing up it was always Oscar Meyer hot dogs, leftover boiled potatoes (I come from German heritage — there was almost always boiled potatoes) and usually (but not always) canned mushrooms. If fresh were on hand (as they were at times) those were used. Basically it is a grand “fry up” of a meal — put everything in a skillet, fry it us and et voila! Garbage Meal. Oh, this was going to be good! First step was to cube up the potato and roast it in a 400 degree oven for about 20 minutes until cooked through. Then the bacon – 2 thick slices fried up and removed and chopped up. Then into the bacon fat went the sliced shallots, sliced hot dogs, sliced porcini and roasted potato. When all of that got nice and golden, then the bacon went back in. I settled into my favorite armchair with my plate and a nice glass of Malbec and was very, very happy. Apparently sometimes it is good to grow up! I am not a breakfast person. As I’m sure you’ve noticed, I have never included a single recipe for breakfast in here. It’s not that I don’t eat breakfast, it’s just that I’m kind of a “grab and go” breakfast eater. I realize that many people out there LOVE breakfast, either going out for it or making an extravagant weekend breakfast at home. One such person is my BFF Ellen who was planning a visit this past weekend. Ellen does not cook. She does, however, greatly appreciate those who do. So when we were planning what to do for her upcoming visit, I asked what her favorite breakfast was. “Waffles and bacon,” she said. Well see, that’s a problem. Not being a “breakfast person” means I don’t own a waffle iron. So I countered with “Bacon is never a problem in this house, but how about pancakes?” Turns out, she also loves pancakes. Another problem: I’ve never in my life made pancakes … before this weekend. Armed with a new culinary challenge, I knew plain, simple pancakes would not suffice. 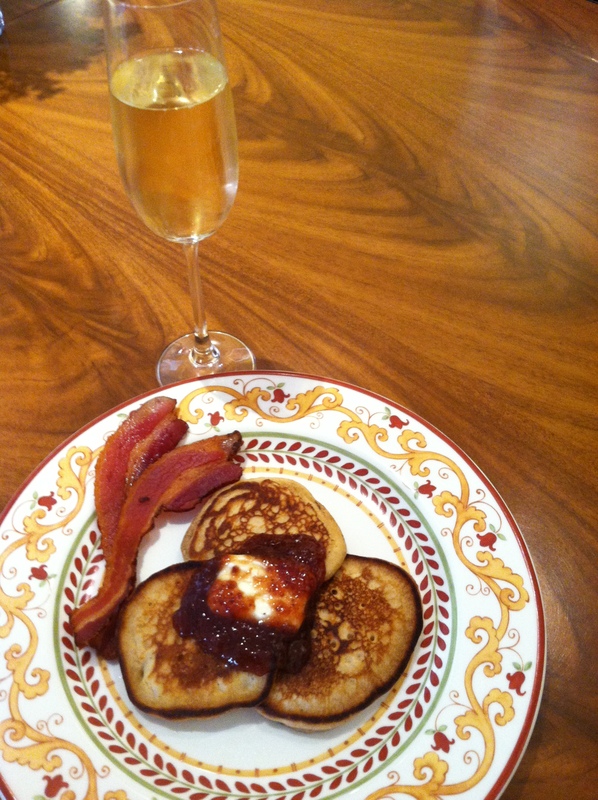 No, if I was going to enter the breakfast world with pancakes…these were going to be special. Enter this week’s Weekly Winner, Peanut Butter Pancakes with Jelly/Maple Syrup. So, on Saturday, into the kitchen we go to whip up this masterpiece. For some one who never cooks, apparently she does have some experience in the pancake arena. When the batter was mixed up, I was all set to add more milk to thin it out a bit. “Oh no,” says Ellen “it looks perfect”. And she was right. It was. The pancake recipe comes from The Food Network. The Jelly/Maple syrup was my creation. Preheat a griddle or frying pan. In a large bowl, whisk together dry ingredients. Slowly mix in egg, milk, peanut butter and oil until combined. Add a little extra mil if batter feels too thick. Let mixture sit 5 minutes. Melt 1 tablespoon butter on griddle and move around to coat entire griddle. Pour about 1/4 cup of batter per pancake on griddle to form 5-inch pancakes. The batter spreads as it cooks. Fill griddle without crowding pancakes. Flip when air pockets start to pop on the top. Repeat with remaining butter and batter. In a small saucepan, combine one small jar of your favorite jelly with about 1/4 cup maple syrup. Warm and whisk together. Chinese food has always been one of my delivery foods of choice. We are incredibly lucky here in Chicago because we can get basically any food from any country delivered right to our door. Handy? Yes. Tasty? Absolutely! Healthy? Well, probably not. 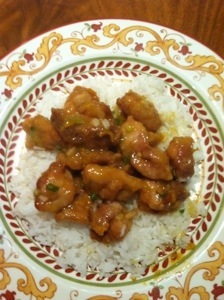 This week’s winner is Chinese Orange Chicken and it is one of my favorite dishes to order in from our local Chinese restaurant. When I saw the recipe appear in my inbox from Epicurious, I knew I’d have to try it. Truth be told it is a bit time-consuming. It is not difficult, it just takes time. And I know there will be some of you that will wonder “why not just order in?” Well, I like a challenge. I like to know what goes into my food (most of the time, at least) and honestly, this was tastier than anything I’ve ever ordered in.